Wednesday October 17, 2018: Hope confronts Brooke, Thorne learns of Ridge's crime, and Bill runs into Brooke. At Forrester Creations, Hope confronts Brooke about kissing Bill Spencer. As Brooke assures Hope she has no interest in Bill, Ridge enters and says, “Of course she doesn’t, she’s married to me.” They recap that Ridge hates Bill, and Brooke assures him of her love before leaving. Ridge promises Hope they’re okay, and Hope thanks him for being understanding. Ridge reiterates they’re fine…as long as her mother stays away from Spencer. In the design office, Katie lets Thorne know that Bill has stepped up and she’s giving him as much access to Will as he wants. Thorne is irritated and wonders if Bill threatened her. Katie advises she’ll share something with him, but he must keep quiet about it. She reveals how Ridge coerced the judge into ruling in her favor. Katie’s shocked that Ridge could do something like this. Thorne muses, “Good for him.” They argue about the custody ruling not being legitimate. Thorne’s unbothered, but Katie frets that it feels dirty. Later, Thorne updates Ridge that Katie’s chosen not to abide by the judge’s ruling. Ridge thinks that’s too bad. Thorne reveals he knows what Ridge did, and wants to thank him for it. Ridge announces they have to stop Spencer; whatever it takes, he wants him out of their lives. At Spencer Publications, Bill teaches Will about getting a return on his investment. Bill jokes and Will’s happy to be spending more time with him. Bill assures him spending time together is his first priority. Bill talks to Will about the sword necklace tradition – one day he’ll get one and be a warrior just like his dad. Bill says it’s time to take Will home. The kid’s excited they’ll drive the blue convertible. Before leaving, Bill picks up the phone and asks Alison to track down Brooke. At the Forrester mansion, Charlie, Pam, Quinn, and Eric have lunch together. Charlie and Pam tease Quinn about not knowing how to use the oven. Quinn admits she feels more at home in her living room and glances at her portrait. Pam comments that she likes Quinn’s painting, but is partial to the original work of art. She offers to leave the leftovers for Eric so he won’t starve to death and Quinn reacts sarcastically. Charlie spills something while tidying and they note he’s a little high strung today. After Pam and Charlie adjourn to the kitchen, Eric canoodles with Quinn and talks about the quirky duo. Quinn thought Charlie seemed jumpy today. In the kitchen, Charlie shows Pam a photo montage to their relationship on his tablet. She loves it, and they flash back over their romance. Charlie replies that he loves her…and her lemon bars. Pam retrieves her lemon bars from the oven and Charlie draws her attention to a concerning lump in them. He eats the bar with the lump, chokes a little, and spits out a diamond engagement ring. Charlie explains the engagement ring is for Pam, and asks her to let him be her knight in shining armor. Pam tears up as she accepts his marriage proposal. In the living room, Eric and Quinn admire Sally’s designs and how well they go with Quinn’s jewelry, before wondering what’s taking the lemon bars so long. At Il Giardino, Bill spots a reluctant Brooke and sits down to thank her for turning Katie around – she fought for him and Will. Brooke says he never deserved to lose his son. 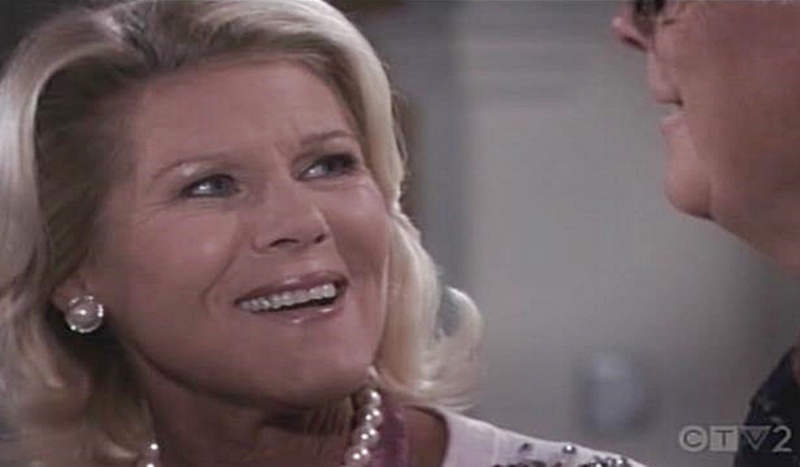 Bill goes on that Brooke’s a hell of a woman – he was an idiot for letting her slip through his fingers. Thorne and Ridge vent about Bill.